The much-anticipated Beefeater London: The Home of Gin will welcome gin enthusiasts for the first time on 22nd May, offering visitors the opportunity to learn about the colourful history of London gin. 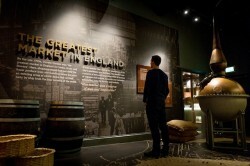 Visitors will take an interactive journey through key moments in the history of London gin with visits to the cobbled Victorian street markets of Covent Garden before learning about the gin production process as they see, touch and smell the botanicals used to create Beefeater’s award-winning range of gins. Beefeater London: The Home of Gin is the capital’s first dedicated gin distillery visitor centre and is housed at the Kennington distillery which has been the home of Beefeater, the world’s best-selling premium gin, since 1958. Tickets go on sale today via www.beefeaterdistillery.com priced at £12.